My knees are beginning to ache from the cold soaking up out of the lichen-covered rocks. The rest of the archaeological team is gathering near the tallest remaining ruins, perching their asses on walls a meter thick and a thousand years old to eat peanut butter sandwiches and slurp instant coffee from styrofoam cups. Between there and here, abandoned digging and sifting tools lie scattered on the moss-green ground, glinting in the hard near-arctic sunlight that passes for summer in Greenland. I turn my attention back to the private little square where I kneel, its parameters neatly marked with twine and pegs, tiny flags planted to show the exact location of artifacts already excavated. I know those pieces so well I can close my eyes and see them, practically smell the millennium-old damp earth hint of rot clinging to their surfaces: three bits of a badly deteriorated iron staff, a silver amulet the shape of a chair carved from a tree-stump, a typical Freya’s necklace pendant. . . . This is a woman’s grave. 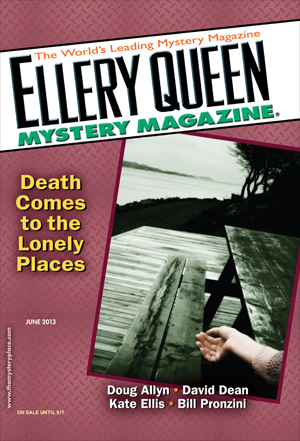 Read the rest of “A Good Thing and a Right Thing” in the June 2013 issue of Ellery Queen Mystery Magazine, on newsstands now!